June 28 will mark 6 years since the U.S.-backed military coup in Honduras took the people’s government away from them. Thousands of people are still in the streets every week demanding that the wrongful president step down.”Whoever’s not jumping supports the coup!” is the shout as a sea of people leaps repeatedly into the air. The makers of an amazing new film called Resistencia: The Fight for the Aguan Valley, will be allowing anyone to view it online for free for two weeks. I recommend you do so. Honduras has not simply turned into the worst home of violent crime. And the people have not simply fled to the U.S. border (much compassion they’d receive there!) — No, thousands and thousands of people in this little nation have taken back their land, occupied it, created communities, and built a future, with or without the coup. President Manuel Zelaya had said he would help. Oligarchs had seized land, or bought land and then devalued the currency. Miguel Facussé took over palm oil plantations, evicted people from their land, got richer than rich, and allowed cocaine flights from Colombia to land on his plantations with U.S. knowledge. The U.S. for years had been funding, training, and arming soldiers for the oligarchs of Honduras. The leaders of the 2009 coup that overthrew Zelaya had all trained at the School of the Americas in the United States. The U.S. assisted in the coup and in recognition of the coup government Hillary Clinton and Barack Obama were part of, and are part of, this ongoing crime, and U.S. military supply shipments to Honduras are at record levels now as the military has merged with the police and turned its weaponry against the people. The coup was followed by phony elections. The people knew to look elsewhere for answers. They looked to themselves. In the Aguan Valley in the north, thousands of families took over thousands of hectares by squatting, building, and farming. And they created communities of such camaraderie that they found themselves saying thanks for the coup. They faced, and still face, regular attacks by killers on motorcycles, but they have nowhere else to go, and they have made the most of it, creating self-sustaining centers of life in the countryside, replacing palm oil monoculture with farming that cares for the land. The dead in the film are of such a different type from the dead in Hollywood movies, that I wonder if people can really see these dead. I hope so. There is never any police investigation, never any charges brought. The people have lost a lawyer and a journalist as well as numerous of their own; the oligarchs have lost a few guards. The people have also organized local and national assemblies. The men have learned to include women in positions of power. 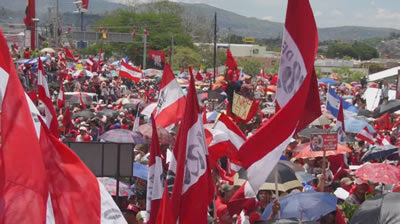 This popular resistance movement always backed the return of Zelaya, who finally negotiated his return to Honduras in 2011. He returned to a people demanding more democratic participation. He joined their movement and encouraged them to participate in the 2013 elections that they had determined to boycott. During the meeting in the city at which the decision to participate in the election was made, the police in Aguan burned and bulldozed 90 houses, plus churches, and schools. The tears and the eloquence of the people affected must be watched; I cannot tell them to you. You should watch the scenes of the people meeting with their ousted president, Zelaya, the rightful president of Honduras, and then watch the scene of President Obama meeting with his usurper in the White House. As Facussé threatens to evict everyone from their land, we see a U.S. State Department official meet with some of the campesinos. They tell him that they are offered land at 14% interest, while the World Bank offers it to the big corporations for 1%. He replies that his only area of work is human rights. So they tell him they have been gassed, imprisoned, tortured, and shot. He replies that he just wants to talk about peace. Or maybe he said “piece” of the action, I don’t know. The people see the United States as working on behalf of Dole, formerly the Standard Fruit Company, the same people for whom the U.S. military has been overthrowing governments since that of Hawaii in 1893. Is there any good reason anyone should ever buy Dole products? The struggle, and the movie, goes on — filmed over a period of years. Leaders are forced into exile after murder attempts. The burned and bulldozed buildings are rebuilt. And the November 2013 elections arrive, and are blatantly stolen. Zelaya’s wife runs on the people’s platform against the “law and order” candidate of the military. Observers from the EU and the OAS declare the election legitimate, but individual members of those commissions denounce that conclusion as corrupt and fraudulent. Students lead the protests, and the protests continue to grow. And the people in the country go right on taking back more of their land and reclaiming it as a source of life rather than death. These people need no aid. They need simply to be allowed to live. All immigrants should be welcomed everywhere by everyone, with no hesitation. Obama should immediately cease deporting children back to a nation he’s helped to ruin. But I think most people would be shocked by how little immigration there would be in the world if the corporations and the killers stopped migrating, and people were allowed to live peacefully and equally in the place they love: their land. This article was posted on Tuesday, June 23rd, 2015 at 3:14pm and is filed under Activism, Film Review, Honduras, Resistance, Terrorism (state and retail).